The fabric of America’s democracy is being challenged on multiple fronts: bitter partisan disputes, economic inequality, divisions between different parts of the country, gerrymandering and voter suppression, the dysfunction of Congress ceding powers to the President, and a collapse of trust in many institutions, especially government. Is our democracy at risk? Longtime Talk of the Nation host Neal Conan and political historian Heather Richardson Cox explore the state of our democracy this election season with a new, six-part series. “The Democracy Test” from Truth, Politics and Power traces examples of similar, and often more dangerous challenges in American history, how our democracy survived them, and what we might do to solve our current difficulties. 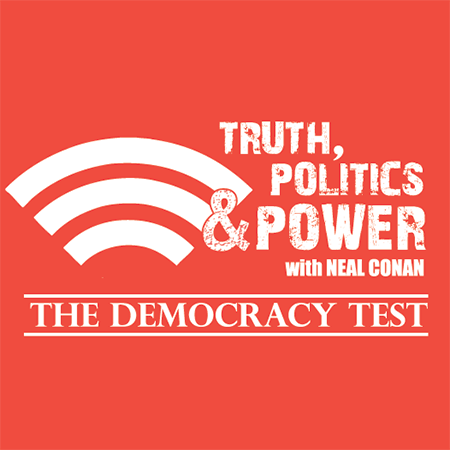 Truth, Politics and Power is a public radio broadcast and podcast with NPR veteran Neal Conan that brings the kind of thinking and conversation we need to understand the changing landscape of American politics and its implications. Over 36 years with National Public Radio, Neal Conan may be best known as the long-time host of Talk of the Nation, where he also played a key role as an anchor of NPR’s live coverage of 9/11 and the invasions of Afghanistan and Iraq. Previously, he served as Bureau Chief in New York and London and covered wars in the Middle East and Northern Ireland. Conan’s work has been honored with, among others, DuPont-Columbia, Major Armstrong and Peabody awards. Heather Cox Richardson is a political historian who uses facts and history to make observations about contemporary American politics. She is a professor of history at Boston College and the author, most recently, of To Make Men Free: A History of the Republican Party.